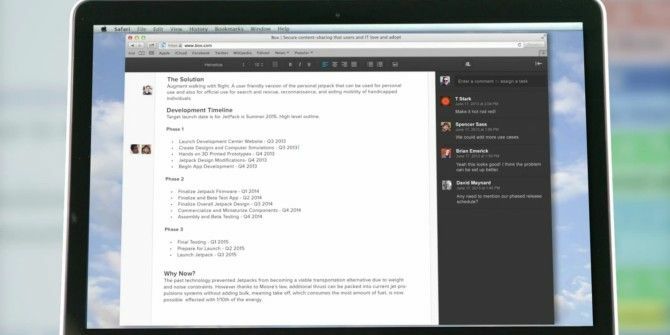 Cloud storage service Box — which some say is great for photo storage — has stepped into the online collaborative note-taking game with the launch of Box Notes, a new free service that lets you create documents, share them with friends and work on them in real time. Box Notes is currently in beta and you can sign up to ask for an invitation. A few users we know have already got access to the service a few hours after registering their email. Essentially, Box Notes is a blank online text field for you to start writing. The rich text formatting tools aren’t shown by default, but highlighting any word will have those appear for you to add a link or leave a comment. The commenting system is part of the focus on collaboration, encouraging users to add profile pics so your coworkers can see you through the new ‘note heads’ — similar to chat heads — which are little circles with your picture. When in collaboration mode, these note heads always show up outside the left margin at the point where your cursor is. This way, it’s easier to know what your colleagues are looking at, and draw their attention to a paragraph that you are reading (since they can see your chat head). You can also add or embed images, videos and rich media files, which can be played in the note. And of course, this is all built on top of Box, so the notes are stored in your cloud drive and can be accessed from anywhere. “Fire up your notes on any platform, anytime. No exceptions,” says Box. Currently, Box itself is available on Android, iOS, Blackberry, Windows Phone, Windows and Mac OS X. Explore more about: Cloud Storage, Collaboration Tools, Note-Taking Apps. Aha, so "no exceptions". If no Linux is not an exception, then what is it? My biggest problem with the "online notes" is when I am somewhere WITHOUT internet (i.e. no WiFi and no 3g/4g). I tried Google Docs, but without any connection, you can't create a document (or, obviously, edit one). I am using Evernote, and it does let you edit and sync later. Does anyone know if Box lets you do that, or is it just an online file/note system? My guess would be no, it won't work offline unless you have the Box app installed on your Windows/Mac. That's kind of what happens with the new Google Drive too. However, you can't open them in GDrive/Box then, you have to use a local app like MS Word, which defeats the purpose imo.